Ever since investing in the stainless fermenter I've not been massively happy with the consistency. Having invested in an iSpindel I've been able to get another perspective on fermentation temperatures. 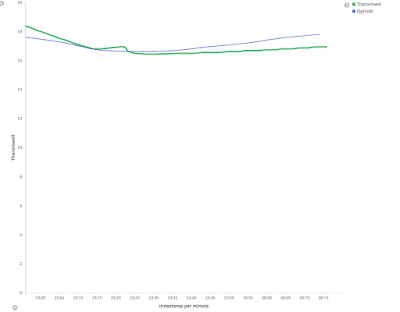 The green-line shows the result from a DS18B20 probe int he thermowell - and on all previous batches this has been the reference for turning the fridge/heating on/off. The problem I now have is that whilst at the start the two readings closely matched . (A) After pitching the yeast the fridge was used to cool down to 17degC, the temperature controller switches on and off at 16.7/17.3. There was an overshoot down to 16.5 degC- this symptom I've seen before on the first cooling cycle. (B) Now the heating begins, and this is where the deviation kicks in - the thermowell cuts of close to 17degC as normal however the temperature of the iSpindel registers at 20deg. I'm putting this down a brew-belt around the top of the fermenter - which will be where the iSpindel is floating. (C) Having seen the big increase (let's call it giving the yeast a kick start) I reconfigured the brew controller to not use the heating - over time (it's Summer) the heat naturally increases due to the ambient temperature and the cooling cycle begins.As the cooling cycle begins the temperatures start to align again. (D) Unfortunately the brew controller never cancelled the cooling cycle, both the iSpindel and thermowell temperature readings report going down to 13.5degC - between (C) and (D) though we have congruent readings :-) Noticing the mistake in the brew controller the flag preventing the heating cycle is removed. This is a lesson that unit testing software is only half the problem - real world testing is still vital. (E) We begin to see divergence in the readings at this point in time we see the thermowell reading 14.6 degC and the iSpindel reading 17 degC. There is then a break in readings of whilst some experimenting happens with the Thermowell probe. (F) After settling on taping the probe from the thermowell to the side of the probe and covering with bubblewrap we are still diverged (but a much lesser amount that during the changes). Ambient is about 24 degC. 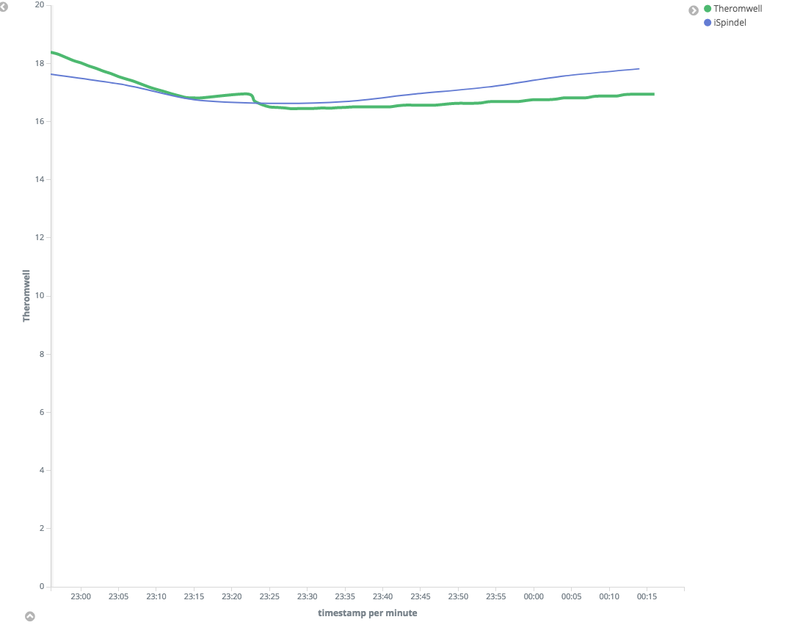 After a cooling cycle trying to reduce from 19.1 degC (external-wall) to 18deg we overshot to <17degC. The ideal placement is *NOT* the side of the ferementer. So having un-diverged the results the probe is back in the thermowell - the fix to get un-diverged was to cover the probe with a thin strip of insulation tape to make the probe a snug fit inside the thermowell. Although I've ordered some thermal grease for next time which should help narrow the gap. 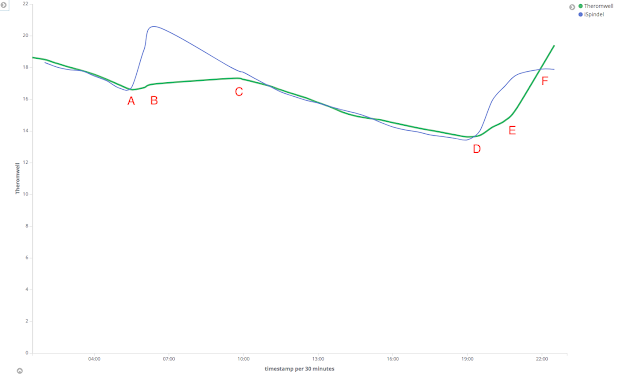 The bump in the graph below shows the transition to the thermowell, and then the divergence of the thermowell/iSpindel. The divergence is <0.9 degC. A couple of assumptions going forward. The thermowell is measuring deeper into the mass of wort - so it would make sense it will react slower. The thermowell is lower own the fermentation bin - the iSpindel is floating on the top - heat rises - so perhaps it is valid to see the iSpindel quicker to increase and slower to decrease. Based on what I've learnt in the first 24 hours - a deviation of 1.5 degress I'll be pretty happy - as long as they start to approach diverging again. 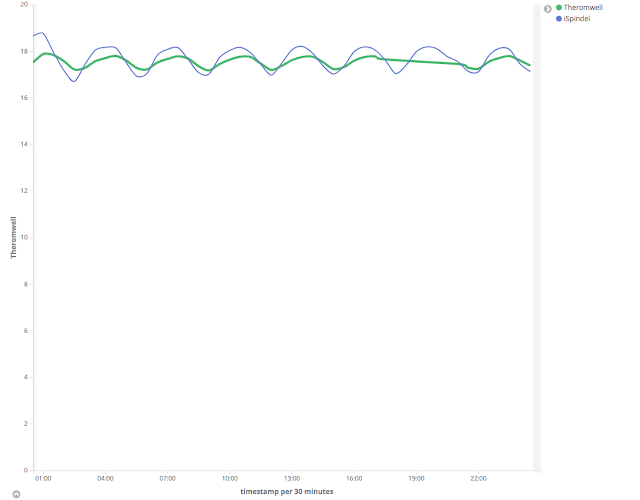 It's quite nice publishing data to Ubidots - although I haven't quite figured everything out - i normally publish the data to a local elasticsearch node (quick and dirty kludge to iSpindel-TCP-Server - which one day I will tidy up and raise a PR for). However running a full ELK stack on Raspberry Pi's isn't feasible. I really like the research/education side of Ubidots - I plan on looking at it in more details and pushing what goes into Elasticsearch (at a lower frequency).